This addendum serves several purposes. One is to alert the reader that we have removed several typographical errors from the posted text. Because there is no impact on content, we have gone ahead and changed our update, as posted on the internet, to incorporate these corrections without indicating change by change what the corrections are. Readers, we are confident, are not that interested in reading about the typographical errors we have made and would be happy just to have a text without them. Second, though the text has a wealth of detail, here we want to add even more. The purpose is to forestall quibbling over technicalities. The labelling of hospitals as regional or national is our own. The Government of China does not describe its hospitals in this way. Some of its hospitals have the word “national” in the name. Our list of national hospitals is not limited to those which describe themselves as national. We used the approved and designated lists published by the Ministry of Health in 2007. From those lists, we grouped together the first and second tier of transplant centres. We then, in the chapter “Exploring Total Transplant Volume”, tabulated transplant capacities for the hospitals in that group. The first tier was the 89 transplant centres selected from over 1,000 candidates and approved by the Review Expert Team of the Human Organ Transplantation Skills Clinical Application Committee, authorized by the Ministry of Health. We referred to these 89 as “national level hospitals”. The second tier contained 75 hospitals designated to perform organ transplants, which were issued 18‑month temporary permits. We referred to these as “regional level hospitals”. Their permits were to be reviewed in 2009, but the review was postponed to 2010. During this period, these hospitals continued to perform transplants. In 2010, 69 of the 75 designated hospitals received permanent approval. 6 were not renewed. However, 6 other transplant centres which were not in the 2007 list also received approval in 2010, suggesting that hospitals not given approval or permits in 2007 had also been carrying out organ transplants after 2007. As of 2010, a total of 164 hospitals were approved to conduct organ transplants. On August 8, 2013, the National Health and Family Planning Commission (successor to the Ministry of Health) published a list of 165 hospitals approved to conduct organ transplants, including Wuhan University Zhongnan Hospital Human Organ Transplant Centre, which performs transplants from donations after cardiac death (DCD). Four more DCD transplant hospitals were added to the list by the beginning of 2014, bringing the number of approved hospitals to 169. The Third Affiliated Hospital of Sun Yat‑Sen University was listed twice in the Ministry of Health’s 2007 list – once for kidney transplants and another time for liver. If we count this as one hospital, the number of national transplant centres would be 88 instead of 89, and the total number of approved transplant centres would be 163 instead of 164 hospitals. Since the Ministry itself used the 164 number, we kept it ourselves, even though, objectively, it is a double counting. On page 17 of the update, we wrote, “The Ministry of Health on May 23, 2007 announced a list of 87 transplant hospitals …” The Ministry of Health described the same hospitals differently in 2007 and 2010. The 2007 list contained the People’s Liberation Army General Hospital (the People’s Liberation Army Hospital 301) along with its clinical divisions. The 2010 list set out two of the clinical divisions separately as People’s Liberation Army Hospital 309 and People’s Liberation Army Hospital 304. The count for the 2007 list of hospitals, using the 2010 description of those hospitals, is 89, not 87. We also referred to “temporary permits to 77 designated transplant centres with weaker qualifications”. These are the regional transplant centres. We arrived at the figure of 77 transplant centres by subtracting the number of national transplant centres, 87, from the total of approved hospitals 164. If we shift to 89 for the number of national transplant centres, the figure for designated regional transplant centres becomes 75. We arrived at the figure of 23 by tabulating hospitals with military and armed police names. However, some hospitals with civilian names were and are, nonetheless, military institutions. That is true of the Nanfang Hospital of Southern Medical University and Zhujiang Hospital of Southern Medical University, allocated to the Guangdong provincial government in August 2004. That is also true of the Wuhan General Hospital, which belongs to the Guangzhou Military Command. As indicated, we based our labelling of hospitals as national or regional on the Government of China list on which they were found. We were working from three different Government of China hospital lists, from 2007, 2010 and 2013. We labelled all hospitals in the 2007 approved list as national and all hospitals in the 2010 designated list as regional. 3) Guangdong Second People’s Hospital. The update provides that there were these kidney and liver transplant centres: 58 national civilian, 23 national military, and 65 regional. Once we reclassify 3 national civilian as military the totals become: 55 national civilian, 26 national military, 65 regional. When we reclassify 3 national civilian as regional, the totals become 52 national civilian, 26 national military, 68 regional. When we add the heart and lung transplant centres (11 national civilian and 7 regional), the totals become 63 national civilian, 26 national military, 75 regional. In Table 10.5 on page 361 and Table 10.6 on page 363, the 55 national‑level civilian transplant centres would become 52. The 23 national‑level military transplant centres would become 26. In Table 10.5, total transplants (in thousands) becomes 266 for national civilian transplant centres and 133 for national military transplant centres. In Table 10.6, total transplants (in thousands) become 531 for national civilian transplant centres and 266 for national military transplant centres. The calculated total volume of transplants remains unchanged, despite the changes in classifications, since the decrease in volume in one category leads to a corresponding increase in the other. In the table on page 361, we updated the count of national civilian transplant centres from 55 to 52 and the corresponding total (in thousands) from 281 to 266. We also update the count of national military transplant centres from 23 to 26 and the corresponding total (in thousands) from 118 to 133. The total and annual transplant volumes in the table remain unchanged. In the table on page 363, we updated the count of national civilian transplant centres from 55 to 52 and the corresponding total (in thousands) from 562 to 531. We also updated the count of national military transplant centres from 23 to 26 and the corresponding total (in thousands) from 235 to 266. The total and annual transplant volumes in the table remain unchanged. The reference to official data here is meant to refer to the total of the publicly available reports of individual executions. China, as noted, does not publish aggregate death penalty statistics. As well, the phrase “death before 1999 remains consistent with that after 1999” should instead be “death after 1999 remains similar to or lower than that before 1999”. The second formulation addresses more exactly the position we intended to take. Death penalty executions did not go up after 1999 and could not explain the increase of transplant volume. But death penalty executions did go down after 1999, making the official death penalty executions explanation for transplant volumes increasingly implausible. Third, we want to clarify some statements we made. As sometimes happens when a writer is immersed in detail, we on occasion wrote telegraphically. We know what we meant but, because of ellipsis, the reader may be puzzled. We have attempted to identify what may be cryptic passages and to elaborate them. As well, generally, throughout our report, we understated our case. Sometimes, on reflection, we went overboard. So, we have been more specific here. 1) In the description of Qilu Hospital Shandong University, we stated that “The transplantation department has over 170 open beds”. We should have stated “The General Surgery department has over 170 open beds”. These are beds which are available for liver transplantation patients, but which also could be used for other surgery patients. In the introduction to Chapter 5 (page 166), we wrote, “This category includes 20 armed forces and 48 civilian transplant centres” and “A full summary of the 68 hospitals …” As may have been apparent, we point out that these 68 hospitals are liver and/or kidney transplant centres; in total there are 75 regional‑level transplant centres. Beyond that, what is now the second two of the three sentences just quoted needs elaboration. There is a discrepancy between Wang Guangce’s reported kidney transplant career volume for 2014 and 2016. His career total posted in 2014 was 1,400 kidney transplants. His career total posted in 2016, on the present day website, is 1,000. The question remains: Why is his 2016 career total 400 fewer than his 2014 career total? 5) At page 392, we wrote: “There were also 300 forced labour camps before the laogai system was abolished at the end of 2013.” This instance of “laogai” should instead be “laojiao,” which refers to labour camps only. The other components of the laogai system (prisons, detention centres, black jails, etc.) were not abolished in 2013. A fourth purpose of this addendum is to inform the reader of additional, corroborative, findings we have made since the update was written. 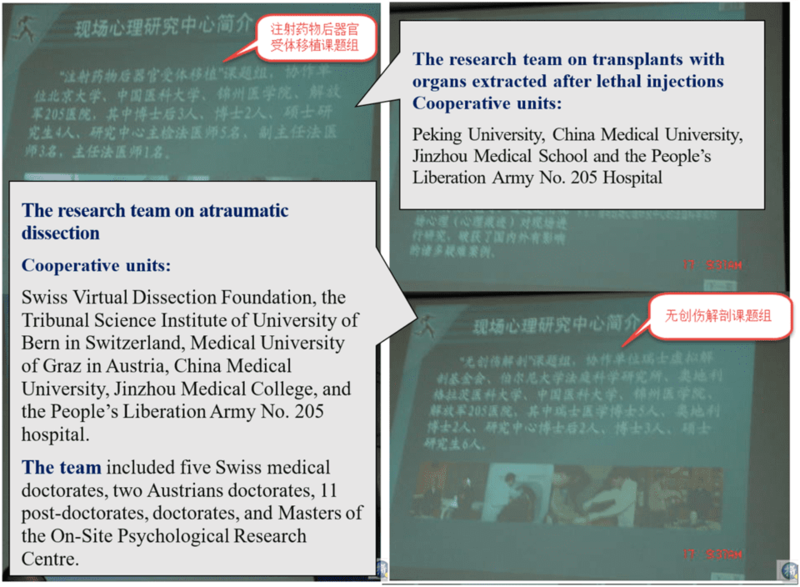 1) For the First Affiliated Hospital of Sun Yat‑Sen Hospital in Chapter 4 on page 70, we wish to add that in 1998, the hospital’s transplant surgery department was formed through the merger of its former abdominal transplant surgery department and former urologic surgery department’s kidney transplant group. Huang Jiefu was the director of the transplant department before becoming Vice Minister of Health in November 2001. At the time, the department had more than 10 doctors, including 3 professors, 2 doctoral advisors, and 4 associate professors and associate chief physicians. In the morning of June 20, Union Hospital’s Cardiac Surgery Department received notice that four “donor hearts” were available for transplant. The department had previously performed heart transplants for two patients simultaneously in July 2009. The same afternoon, the hospital’s vice president Hu Yu gave the order to perform four heart transplants simultaneously and mobilized personnel in primarily the cardiac surgery department but also in the anaesthesiology, operating rooms, ICU, blood centre, and nursing departments. More than 200 medical personnel, including 13 professors and 17 associate professors from the cardiac surgery department, split into four teams, each of which independently completed donor selection, procurement, matching, and transplantation. On June 21 at 10:43, four hearts were simultaneously transported to operating rooms at Union Hospital. At 11:50, led by Professor Dong Nianguo, director of the cardiac surgery department, four specialist teams began performing four heart transplants at the same time. In the 22 minutes between 13:47 and 14:09, the four hearts were beating again in four end‑stage heart disease patients. On June 24, the Wuhan Union Hospital Cardiac Surgery Department announced that these four transplant surgeries were successful and had set a national record. 4) In addition to the types of transplants mentioned on page 277 of the update, we have found complete transplant price lists published on some hospitals’ websites. These lists include a full range of organ, tissue, and cell transplants. One can see that many types of transplants have become routine procedures. The surgery fees are set at extremely low levels. We give two examples. The fees charged are per operation, covering only the transplant surgery (doctors’ fee) and exclude organ and procurement costs. We had already found that at least 75 non‑approved hospitals, already listed in Appendix I, were issued permits for pilot runs of transplants from donations after cardiac death (DCD) starting in 2011. We observe here that, because the pilot program requires hospitals to meet a certain threshold for survival rates for transplants performed in the past five years, it is apparent that these 75 hospitals continued to perform non‑DCD transplants after 2007. We also had already found that some hospitals that had already been approved for transplants by the Ministry of Health applied and were approved for DCD pilot programs as well. A list of these hospitals can also be found in Appendix I. We observe here that this approval allowed them to expand the number of transplant types they could carry out and potentially disguise otherwise unexplained sources of organs. 6) At page 375, for the text which begins “Wang Lijun also presided over a major …” we now provide a screenshot as the evidence and a reference, because both the original and backup links in the original text are no longer accessible. Figure. A brief introduction of Wang Lijun's "On Site Psychological Research Centre" at a seminar. Fifth, when we were transcribing from one version of our text to another or from the source to our text, transcription errors on occasion crept in. On occasion also, our translators committed translation errors. 1) At page 348, we wrote “On October 10, 2011, the Central Propaganda Ministry, the Ministry of Health …” This date should instead be May 10, 2011. The error occurred when transcribing from the source. 3) At page 272, we stated that No. 474 Hospital of Lanzhou Military Command could carry out 12 kidney transplants at once. A direct translation of the source shows that it can perform “12 kidney transplants consecutively at once.” While that wording does not explicitly state that the transplants are performed simultaneously, it still validates the centre’s significant transplant capacity. 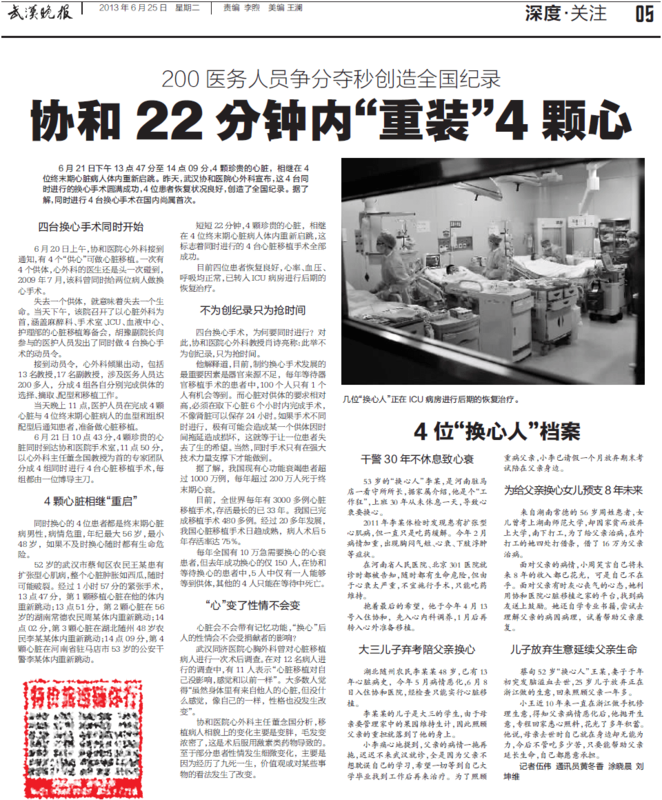 4) At page 372, we listed 53 transplants reported in a medical journal for Jintan Hospital of Traditional Chinese Medicine in Jiangsu. This number should instead be 52. The number 53 was transcribed incorrectly from the referenced source. We checked the endnotes to make sure the links worked. In some cases, they did not. So we corrected the links to ensure that they did work. We also moved some endnote placements in the text, so that the endnotes more directly linked to the text for which references were given. Our translators went over the endnote translations and, in some cases, replaced them with better translations. We also added some endnotes to make the references more complete. We had originally run one numbering series, combining numbers for figures and tables. So, for instance, the first table in chapter nine, which followed the first figure, was table 9.2 and not table 9.1. For the text as now posted, we have separated the two numbering series so that figures and tables each of have their own are numbers independently one set from the other. We made a variety of formatting changes, to make the text look more presentable. These formatting changes were not accompanied by changes in content. So, aside from drawing to the attention of the reader that they were made, we did not feel it necessary to set out exactly what those changes are.